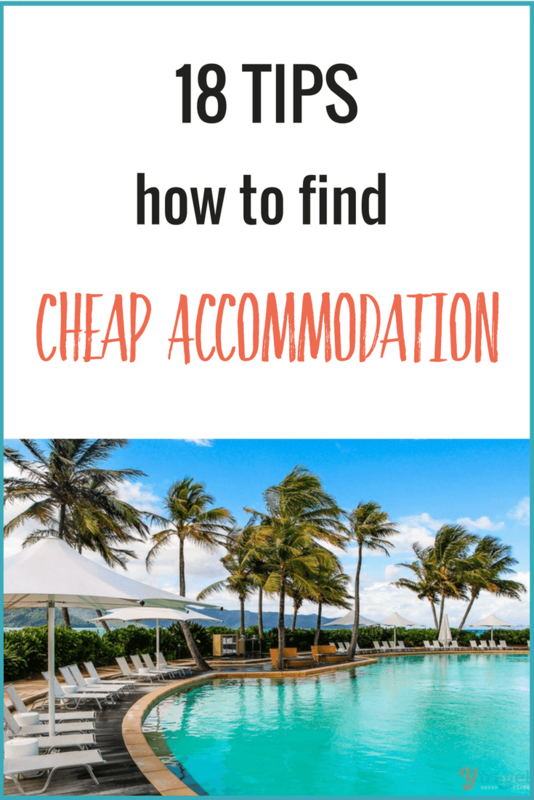 Where you sleep at night is one of your major fixed travel expenses, so learning how to find cheap accommodation will help you to keep more money in your pocket for spending on activities. Fortunately, there are plenty of tips and website resources these days to help you find safe, practical and value for money accommodation. For us, traveling with our kids is not always about finding the cheapest deals, but getting the BEST VALUE for our money! We don’t like to rough it as much as we used too pre-kids. How you travel and spend your dollars is totally up to you, but we all need a place to sleep at night and we may as well get the best accommodation deal as possible. Getting 15 percent off a room you don’t want isn’t always better than regular price at a room you do want! So our goal is to help you save money on accommodation and get the price you want, at the place you’re happy with. The style in which we personally travel has evolved from solo travel, to traveling as a couple, to now being a family of four. So our accommodation preferences have changed as well. Depending on the length of the trip and the destination, we’ll chop and change between accommodation styles. Access to a full kitchen saves you money by not eating out every night. Separate bedrooms from the living room make it easier to put the kids to bed. You can book a 3 or 4-bed apartment and split the costs with another family or friends. These extra facilities on a long stay can make your trip so much more enjoyable. But if it’s a short city stay, or we’re just traveling as a couple, we’re happy to stay in a hotel and sometimes we’ll cut costs and find a family friendly hostel. If you are on an extended trip around the world, consider spending more of your time in countries and regions where your money travels further, and when visiting the expensive countries lower your accommodation standards. There is no point finding cheap hotel accommodation if it is miles out of town and you have to pay extra in transportation costs. Stay in a central area close to public transport, airports, local attractions, food outlets, the beach, the park, and the ability to get out and walk to most things. Many accommodation providers offer their best deals when you stay more than one night. Often we’ve had deals like stay 4 nights, pay for 3. Especially in the off-season. Many hotels receive Friday and Saturday night accommodation bookings from leisure travelers and Monday to Friday bookings from their business travelers, so there can be a void on Sunday nights meaning possible cheap accommodation..
We’re stunned by how much the prices for accommodation can rise on the weekend – some places triple. One of the obvious tips on how to find cheap accommodation is by traveling in the shoulder season, that time period between the peak and off-peak season. Accommodation costs will be lower, the weather will still be favorable, and in popular destinations you’ll avoid the large crowds which make sightseeing easier. This is also the best way to save money on flights and car rental. Win-win! This is one of our best travel tips on how to save money – especially for families or small groups. Apartments and rental homes like on Airbnb are a great way to cut costs. They are usually cheaper and more practical than a hotel. If you’re traveling with other family members or another couple why not get an apartment big enough and share the cost? Staying in hostels may not be a great option for the USA due to the lack of quantity and quality, but in places like the United Kingdom, France and Thailand the network is extensive and the quality is ever increasing. Don’t think of hostels as just dorm rooms for backpackers. Many offer private and family rooms so they can be one of the best cheap alternatives to hotels. Hostels in major cities are located close to public transport and tourist sites. A private or family room is typically cheaper than a hotel room and they generally have cheap and free services such as wi-fi, a laundry, luggage storage, fully-equipped kitchen facilities, and local tours. If you can’t find cheap hotels in the city center, staying slightly outside of the city will almost always save you money on the cost of hotels and apartments. If you don’t mind the short commute you might save a bundle. But as mentioned in point #1, be careful that if you find accommodation far away from the attractions you plan to visit that it doesn’t result in high transportation or parking costs, or precious time. Research the area’s public transportation system! Book accommodation in advance at the best rate you can find online, then keep an eye on prices to see if you can get a better deal at another property, or even at the same hotel. For example, Booking.com offer free cancellation on most rooms. And their book now, pay later at check-in system allows you to lock in that rate with some flexibility. Just check the booking conditions per room type and you’ll have peace of mind when booking through them. Again location is key when choosing where to stay, so make sure you have access to local cafes and restaurants. When staying in a major city it will almost always be cheaper to walk to a nearby cafe or restaurant than dining in the hotel, unless you get free breakfast as part of your booking. If you do eat in, does the hotel have a restaurant with reasonable prices? Does it have a kids menu? Does it have room service? Does it cater to your dietary needs? Does your hotel have free WiFi, free airport shuttle, free breakfast, free cable TV, laundry facilities, a pool, BBQ areas, private rooms with en-suites, a tour booking desk, 24-hour reception? Is there a fridge, microwave, coffee machine? A fridge and microwave can be great for storing and reheating leftovers which saves you money on eating out. This is great for families storing milk, juice, and yogurts and other kids breakfast items to have on hand first thing in the morning. Who are you traveling with? Can you share beds to cut costs per head? For our family of four, we require two double beds, or a queen and two singles. If you have a baby make sure a portable cot is available and for free! If you frequently visit the same hotel chains or hotel booking sites, join their rewards or membership program. We can’t say which is the best program, it depends on your travel frequency, how and where you travel, and what your priorities are. To maximize your earnings in any rewards program, charging your hotel costs to a credit card tied to the rewards program is essential. All cards will give you bonus points for spending, and the best cards will also give you instant elite status in the hotel program, which means more bonus points. One of the best travel perks. Check the program and benefits for your particular credit card, you might be able to use your points for accommodation costs. In Australia we had the American Express card through the Commonwealth Bank that allows us to use our reward points for booking travel. Go and “LIKE” your favorite search sites on Facebook and follow them on Twitter. It’s getting more and more common for sites to release cheap accommodation deals directly through their social media channels. Subscribe via email to your favorite booking sites. They often distribute deals and special coupons only to their email subscribers and members. 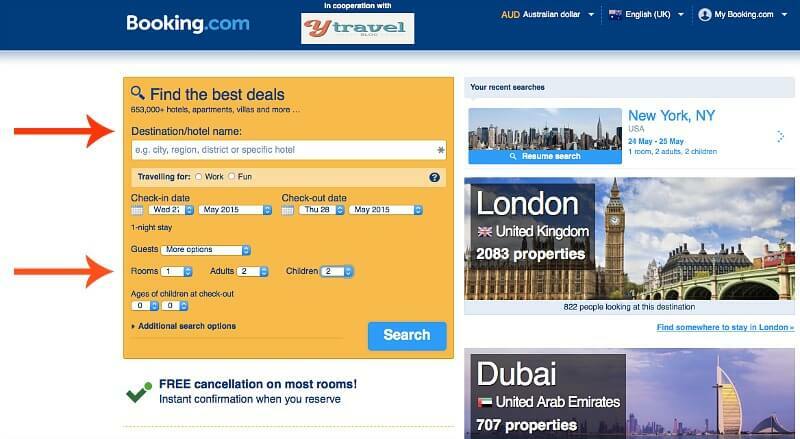 When searching for cheap accommodation deals, use a different browser or go incognito before looking up prices a second time on a particular booking site. Websites store your search data and when you come back they know you are more likely to book as a repeat visitor and will charge you more. We’ve been traveling consistently for 17+ years now, and have come to rely on a few trusted websites that help us to save money and time searching! Down below are the travel accommodation sites we personally use. To be clear, if you choose to book accommodation through one of our preferred partners we will earn a tiny affiliate commission (at no extra cost to you) and you’re helping to keep the lights on at yTravelBlog so we can continue to bring you awesome travel tips and inspiration! 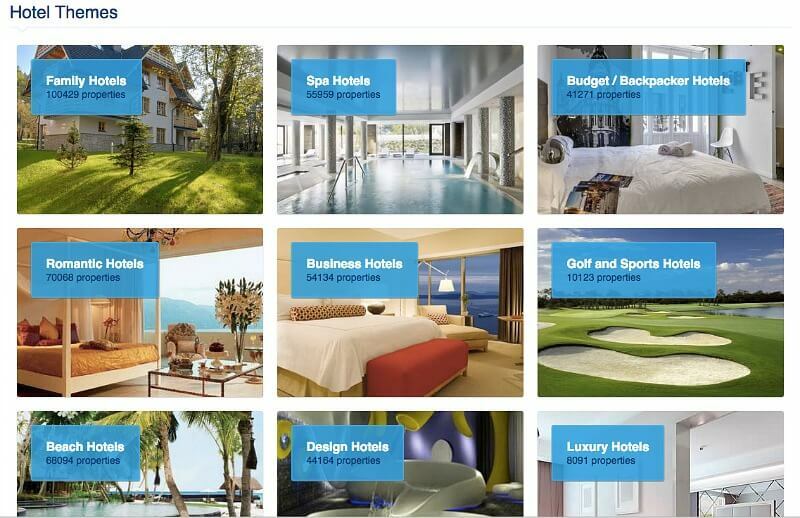 To book hotels online, our favorite website is Booking.com who have over 1.3 million properties worldwide in 200 countries, and they’re still growing daily. We believe it’s the best website to book hotels because they have all the major brands, plus you can find a variety of low-cost independently owned hotels that can be difficult to find elsewhere. Using their search box is simple. 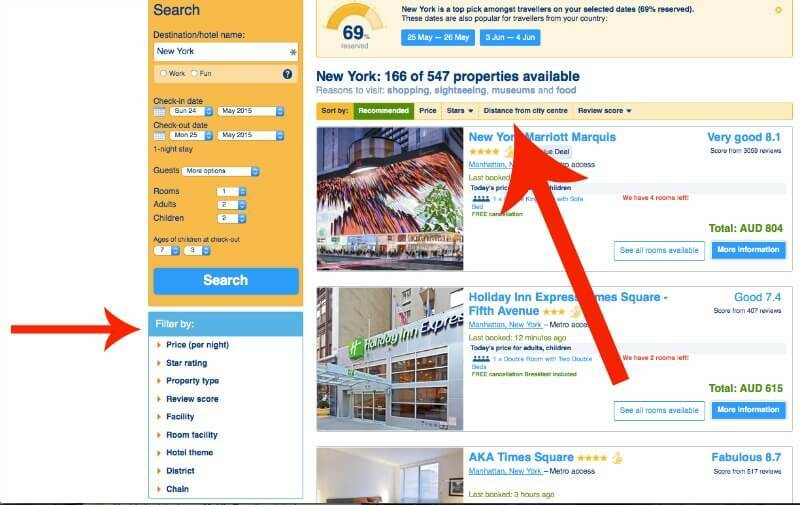 You can search hotels via destination or hotel name and choose the number of rooms and adults / children. Another reason we believe it’s the best site for hotels is because they have millions of verified reviews – only people who have booked through Booking.com and stayed at the property can write a review as they receive an email once they have checked out. That means their reviews come from real guests, like you! To read reviews on a property and see the score breakdown simply click on the review score. On the topic of reviews, pay attention to what is important to you as a traveler. Look at the good reviews, look at the bad reviews, and try to find threads of consistency. If many people are complaining about one thing in particular, then that’s probably a good indicator that the hotel has a problem with that! It doesn’t end there with Booking.com. 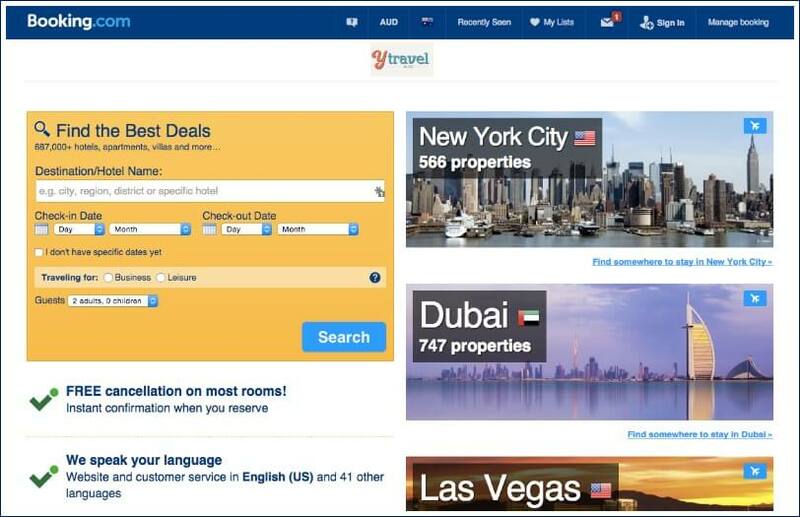 You can also search for hotels near Airports and the most popular Landmarks around the world – another handy feature that makes it the best hotel booking site! Hotwire can be great for last minute deals. 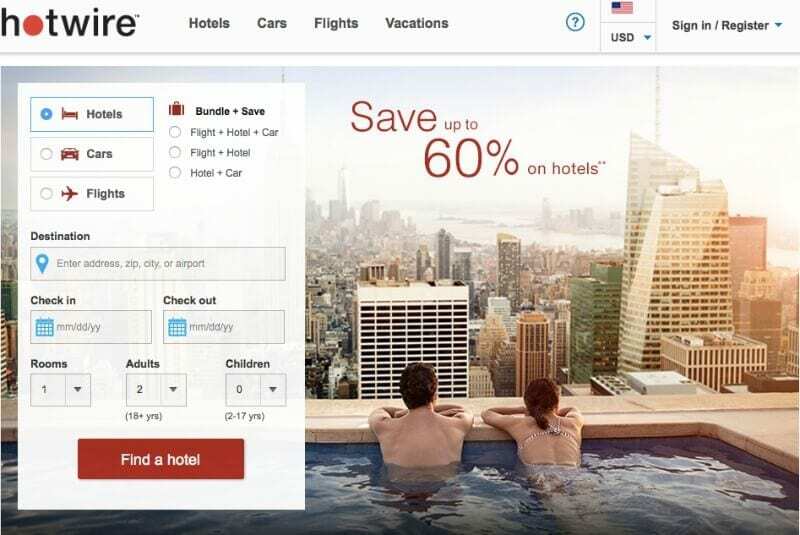 If you care less about a specific hotel brand and more about wanting to save money, consider shopping the anonymous hotel inventory on Hotwire. You won’t know which hotel you’re staying at until it’s booked, but you can request the general location and quality (three-star, four-star, neighborhood etc). One of the great deals we’ve got on Hotwire was a 4-star hotel right in the heart of the French Quarter in New Orleans for $50 a night. And recently when we were already in Knoxville, Tennessee and I found myself asking the question; “where can I find cheap accommodation near me”, I jumped on Hotwire and got a good deal downtown! As mentioned, apartments are a great way to save money on accommodation and often work out cheaper than a hotel room, particularly when you factor in the savings of cooking your own meals and sharing with other couples or friends. Airbnb is a site we used often on our trip around Australia as a way to get low-cost apartments, or even rent out people’s entire homes. 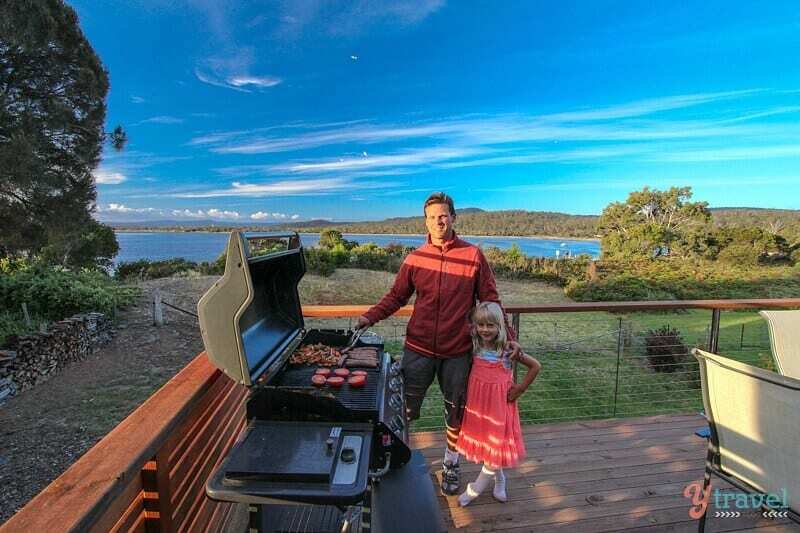 This one deal in particular, we got in Western Australia for a 4 bedroom house was exceptional. Airbnb are in 180 countries worldwide and offer a great way to connect people who have space to spare with those who are looking for a place to stay, whether you need an apartment for a night or a home for a month. You can book entire apartments or just spare bedrooms, allowing you the choice between having the place all to yourself or staying with and getting to know the owner. Even if you never meet your host, you’ll get to feel more like a local. If you are new to Airbnb, we have a $45 AUD credit voucher for you when you sign up here. 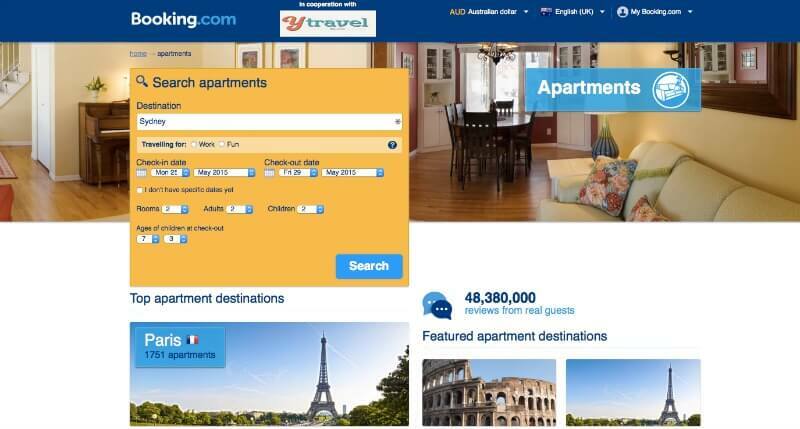 Booking.com also have a great inventory of apartments to help you find the best deal, wherever you travel. Again you can filter your search results based on what’s important to you. Before we had kids, we stayed in hostels often to save money on accommodation. You can choose to either pay for a dormitory room in which you’ll share with other guests, or you can pay for private rooms with shared or private bathrooms. It depends on your budget, comfort level, and whether you are solo, a couple or a family. Hopefully, the above strategies and resources will help you to find affordable hotels, apartments and resorts for your next trip and get you the best value your money can buy. I hope this article gave you some great ideas on how to save money when you travel. Please share this page with a friend and fellow travel lover and help them save some extra cash too!